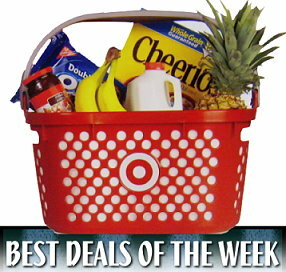 These are the best deals I see for the week of 6/26. Please keep in mind it is possible for some sales & prices to vary by region. This post is just a highlight- the complete ad with matchups is HERE. It is always a good idea to print the Target coupon policy and take it along with you and bring your reuseable bags for 5¢ credit each. If you’re looking for coupons for other items on your list, check the Coupon Database to see where you can find it or if there is a printable coupon available. This post is just the best Gift Card & Special Purchase deals I see for the week, You can see all other Special Purchase & Gift Card Deals HERE in the complete ad. You can also view any other unadvertised or extended Special Purchase or Gift Card Deals by visiting the Special Deals Page. = $11.98 for 2 Giant Roll 8 Packs & 2 Bounty Napkins. *Note- the Ultra Freshmatic Kits are on Price Cut for $6.99, and you can use the $4/1 Air Wick Freshmatic Ultra Starter Kit on Home Solutions or in the 6-12-11 SS x7/24. It’s a better deal since you will get more units. Some Nice Apparel Coupons to Bring Along and watch for clearance…. These are just a few of the deals going on right now. For more great deals you can pick up be sure to visit the CHEAP FINDS PAGE and also check on the PRICE CUTS PAGE to see what else interests you. These pages are all updated frequently. Some of you have even found bigger drops of up to 70-75% Off in Home Outdoor now! So take a good look around- everything from picture frames, folding chairs, all kinds of bedding, decorative items, Plastic 3-drawer storage dressers and more! And toys toys toys! My goodness there sure is a lot of Toy Clearance! It’s a nice way to stock up for Christmas, Birthdays and to pad the gift closet if you find some good buys. There has also been quite a bit of Burt’s Bees, Sonia Kashuk, and Olay Regenerist Kits. You won’t always see the clearance moved to endcaps either- so check the regualar shelves too if you have interest! If you are short on coupons you can use a clipping service (I highly recommend My Coupon Hunter & 4U2Coupon or you can also search for coupons on eBay. Haven’t seen the ad yet but if the buy 3 Nabisco doesn’t restrict size, could you price match the Nabisco 4-8oz on sale at CVS for $0.99, then apply the coupon on top of it? Wow I never checked their price match policy, I matched to Cvs awhile back. Oops. Thanks for the heads up. I can’t find the cooler deal in the ad? The ground beef price is great. Getting it for $1.99/lb or less is really hard nowadays. If you bought an Oral-B power toothbrush (like the Vitality that was FREE at CVS about 6-8 months ago), there was a coupon for $3.00 off the refills in the box. This will go well with the $10 price they have in the upcoming sale. Yes. Target does NOT price-match loyalty card stores per their policy. However, Walmart will price-match it if you show them your card. Used 2 b2g1 q from all you and 4 $2 off Mens nivea body wash to get 6 body washes for 4.16.They were price cut to 3.04 each. Tacoma WA store is at 30% right now on the toys…waiting for the DEEP discount! Good to know about the price match….would Walgreens work though? I do know that the Walgreens ad says Nabisco cookies and crackers 2/$5. You could get the more expensive Nabiscos and price match them down to $2.50? Kerry, did you mean $5 for 10 sobes after GC? It says $5 for 5. Also I’ve been seeing lots of Calypso St Barth for Target clothes, totes, hair accessories, make up bags on clearance. This is pricier stuff but might get better if it reaches 75% off. Their clothes are so pretty, specially for those of you living on the coast or going on a cruise! I’m new to shopping and saving at Target. Do they restrict how many gift cards you can get per transaction? For example, could I buy 20 sobe lifewaters and get 2-gift cards? Thanks! I know it is different at all stores, but my cousin is a manager at a target in the chicago burbs and she said her store is going to 50% clearance in Toys on Thursday. In the second week of July they will go to 75% to make room for what she said they call the “Christmas inventory” in the last week of July. Hopefully most stores will follow this same pattern!! There is a two pack of french’s mustard (reg. mustard and honey mustard) for 1.47. There is a $1.00 coupon (can’t remember if RP or SS and date sorry) for Honey mustard. Paid .47 for both! The ice cream in my ad (Chicagoland) is either Edy’s or Haagen-Dazs. I have never seen Dreyer’s ice cream. That must be a regional ice cream? Not sure if it’s regional or not, but in my ad it shows that coke products are on sale ( 12pks ) for $2.79. That’s an awesome price! Be sure to check inside your Sunday newspaper. On the back page of one section, there’s a full-page target ad with a coupon for a $5 Target giftcard when you purchase all of the following: 8 oz. or larger Wish-Bone dressing, Pepperidge Farm hamburger buns, 30 ct. 1 gal. Ziploc freezer bags, and 75 sq. ft. up & up foil (exp 7/16/11). I’m not sure what all of this costs combined but think there are matching coupons for a few of the items available. I just wanted to let everyone know I found clearance garnier hair products at my target ($1 for mousse plus a hairspray and 1.98 for shampoo and conditioner. these came packaged with a $1 coupon for any garnier product….so you could go back and get another packaged deal for free or super cheap! Missy, showing up under beauty for me, or just scroll thru.. just printed it…. hth! Found it, printed it, going tomorrow! thanks Corey! Be careful with the Newton’s Fruit Thins TQ. I used it today with the deal and it completely overrode the freebie, so instead of getting the box for free AND the extra $1 off I only got the dollar. for the bounty napkin/ Bounty Giant roll deal that you have listed, I can’t see to found the $1 off of one pack of Bounty Towels. I found a coupon for $1 off Bounty Basic Rolls 6 ct or higher. Would that work? My Target actually had the frozen chicken breast for $5.84, it was the seasoned breasts that were $5.99. And the Ortega seasoning packets were only $0.64. 🙂 I know it’s all regional, but every penny counts. Also I stopped in to Target around 6:30pm Sunday and every last Sobe was already gone. Crazy. Guess I’ll have to go back again later in the week, I love those cranberry apple lean teas they make. What is “YMMV”? I’m a newbie. the bounty napkins comment is because the napkin holder is filled with bounty napkins so the coupon should be good towards that item. RE: The Bounty deal– My PG insert has a coupon for $1/1 napkins and .25/1 towel or napkin, but no $1/1 towel. Am I missing a coupon? I’m in south FL.. anyone else having this issue? the sobe 10 for $10 and get a $5 gift card at my target they have had some hang tags which are buy 3 get one free (which is $1 off) you can use a total of 3 in one transaction so you get 10 for $10 plus $3 off and a $5 giftcard…. you are getting 10 for $2. It’s crazy! If you’re in Florida and got the latest Albertson’s ad, there’s a MQ for $3/2 Kingsford Matchlight 12.5 lb bags…goes great with the gift card deal…2 bags for $10! Regarding the Bounty Deal. Does anyone know it the $5/2 TARGET coupon was in the Detroit area RedPlum and I just missed it? Thanks for any information! Regarding the playtex deal – FYI – The 36 ct boxes I bought had $1 off 1 coupon inside.